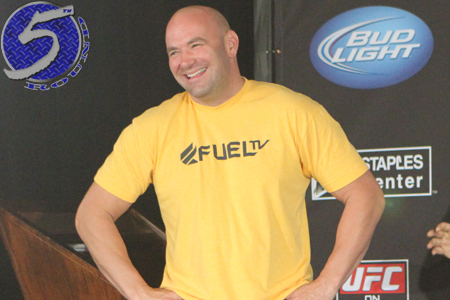 It’s fight week, so you know what that means – it’s blog week for UFC president Dana White (Pictured). In anticipation of Saturday’s “UFC on FOX: Henderson vs. Diaz” extravaganza, White takes fans behind-the-scenes at the Octagon’s last card, shows what Ronda Rousey has been up to (literally) and gets predictions on this weekend’s scraps from “The Ultimate Fighter 17” coaches. Not so surprisingly, Jon Jones and Chael Sonnen disagree on who leaves Seattle with the lightweight hardware. Sonnen predicts Nate Diaz will serve up the upset special, while “Bones” believes Benson Henderson will retain his strap.